If you want to go pro, don’t go plastic. With its rugged metal body, NS7II crushes the competition, literally. It’s built like a tank. For the performing DJ, hot cues are simply too important to bury. With dedicated buttons to set and recall, NS7II places comprehensive hot cue control at your fingertips, no digging required. NS7II’s filter knobs give you unprecedented capabilities. Each filter has three modes: Filter alone, Filter FX, and Filter Roll. A first-of-its kind feature that revolutionizes modern DJ performance, NS7II’s effects and EQ knobs are intelligent, responding instantaneously to your touch, giving you capabilities you haven’t even imagined ... yet. One tap of the Shift and Touch buttons and NS7II’s traditional EQ knobs become touch-responsive. Kill the low. Kill the mid. Kill the high. Or kill the entire song, all with your fingertips. All four channels on NS7II feature touch-response EQ knobs, giving you instant on/off control for dynamic creative flourishes whenever inspiration strikes. With one tap of the Filter FX button, each of NS7II’s four filter knobs commands both its filter and an effect of your choice. Turning the knobs will engage a high-/low-pass filter plus the effect, and both the filter and effect increase or decrease in intensity as you turn the knob. To add an effect, touch the knob. It’s that easy. To adjust the effect, turn the knob. It’s never been easier to interact with your mix. NS7II empowers you with spontaneous performance capability that feels so natural, you’ll wonder where you end and the music begins. 12 Isotope effects to choose from, 2 effects banks per channel, 3 effects per bank, 6 effects simultaneously on any channel. For decades, Akai Professional’s MPC pads have been the go-to for performance and production with an unmatched percussive feel and response. NS7II gives you expanded live performance capability with 16 MPC pads—each has classic MPC feel, plus they’ve been updated with RGB illumination, so you have instant visual feedback of what mode you’re in. No guessing. No vague mono-color flashing. NS7II’s 16 multi-color pads tell you exactly—and instantly—what mode you’re in, so you can spend your time mixing instead of decoding. NS7II’s direct drive turntables let you start and stop tracks instantly, or you can use the new Start time and Stop Time controls. Another creative tool in your arsenal, this attention-grabbing feature lets you ramp up or ramp down the turntables, perfect for getting the the night started or bringing it to a classic close. Whether you have 1,000 songs or 10,000 songs, NS7II gives you total command over your music library with dedicated controls that keep your hands off the mouse and your mind in the mix. Easily accessible, the Pitch Bend and Tempo controls are exactly where you need them to be with nothing in the way. You'll never graze a slider or button by accident with NS7II's fool-proof layout. Mixing in the dark is easy. Every crucial function on NS7II gives you visual feedback, including the Tempo faders, which have a red LED at 0, so you can be 100% sure—instantly—when the fader is back to center. With NS7II, beatmatching is visual, quick, and obvious. You never have to look at your computer again to match BPM. With NS7II, critical capabilities have dedicated controls—they’re not buried and don’t require you to use modifiers or spend time accessing submenus. The Bleep/Reverse switch is solid and spring-loaded, so it returns to center automatically. Over time, mixing becomes an instinctual experience driven mostly by muscle memory, so NS7II is designed with your intuition in mind. The four new deck selection buttons are large and located exactly where you need them to be. Combined with its multi-color and intelligent touch-response capabilities, NS7II’s entire control surface makes mixing second-nature. NS7II’s main mic input has its own dedicated channel, so all four mixing channels are always available, never taken up by your mic. Plus, the second mic input can be assigned to any channel and switched on and off as needed. Connect drum machines, keyboards, microphones, CDs, or even turntables. NS7II has all the inputs you need on the rear of the console. Underlying the immense creative capabilities of NS7II are practical onboard controls to give your mix a solid foundation. The all-new Beat Grid buttons let you fine-tune your beat grid on the fly, so all of your effects, slices, and loops fire off perfectly. All of your primary controls are easily accessible on NS7II, and when you need the second layer, two large shift buttons give you instant access from either deck. And they’re positioned so you only hit them when you want to. Slip Mode keeps the track moving but muted when you grab the record or start scratching. When you’re done, the track will resume as if you’d never stopped it. Slip Mode combines with With NS7II’s motorized platters and real vinyl discs to give you the ultimate modern platform for turntablism. Some things can’t be improved upon. Taking another cue from the classic turntable setup, NS7II features track indicators on both vinyl records to keep you visually locked on your cue points. Does the NS7II have an attached laptop stand option like the original NS7 did? Yes! The NS7II laptop stand will be available in late 2013 (sold separately). What DJ software supports the NS7II? The NS7II is a native plug & play Serato DJ controller. The NS7II may work with other DJ programs as it is MIDI compatible. Check with your favorite DJ software manufacturer for compatibility. Can the motorized platters on the NS7II be disabled? Yes. The NS7II's motorized platters can be turned off by pressing the Motor Off button on the unit itself. Yes. The CP-Pro long life crossfader is user replaceable. What flight/travel case can I use to transport my NS7II? The NS7II can use any case that fits the originally NS7, as well as new cases built specifically for the NS7II. There are many vendors that offer flight cases. Why should I get NS7II instead of a digital vinyl system (DVS)? NS7II gives you all of the great features of a DVS system without any of the worries of setup, the fear of skipping or damaged needles, or the need to touch a mouse or keyboard. Track navigation is easy using NS7II’s onboard controls. You also get hands-on control of great features like on the fly, instant looping, instant cues, and optional beat-sync operations. With a very easy and setup and installation process, NS7II lets you focus on what you do best. Simply plug it in and go. Will the mixer inputs work without the computer connected? Yes. 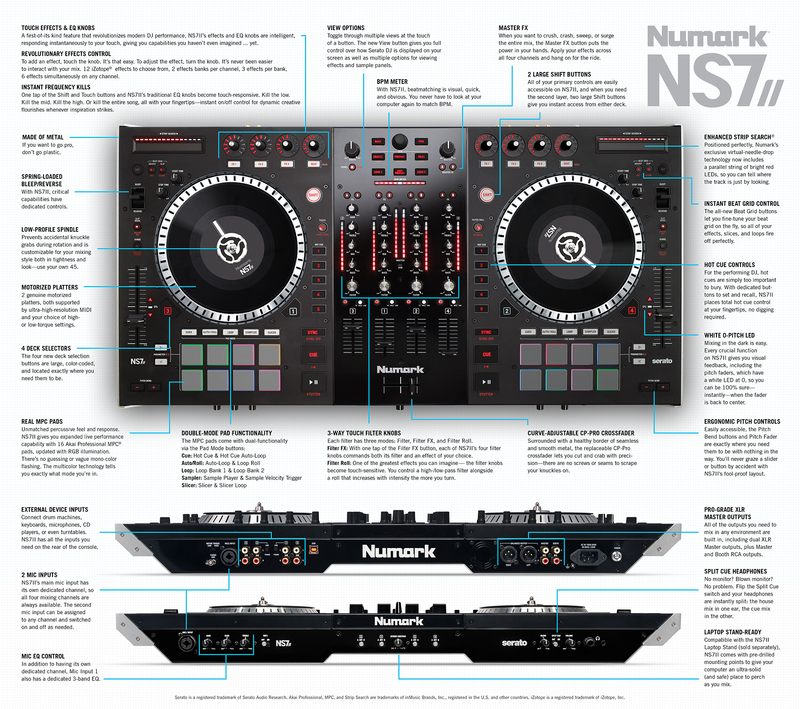 You can customize NS7II with your own vinyl and slipmat for the perfect look and feel. You can also adjust slip pressure to your personal preference. Yes. We realize that every DJ has their personal preference when it comes to turntables so we have included two torque settings. When set to the high "modern" setting, the NS7II feels very similar to a Numark TTX turntable. In this high setting, the pitch fader responds very quickly. We designed the lighter "classic" setting to be very similar to another very popular turntable's feel. In the lower setting the pitch fader response is gentler.